Uganda & Rwanda Gorilla Trekking in Uganda and Rwanda is first on our travel Bucket List. Mountain Gorillas only live in the wild, so this tour is your chance to see them. From $3800 / person | Comprehensive package including accommodation for all nights, in-country transport by private bus, train, or flight, lecture and instruction materials from our expert guides, all activities as listed on the itinerary, and 2 meals per day. *One Gorilla Permit is only included for travelers booking at full price. Permit Prices in Uganda are $600 / person / trek & cannot be discounted. Embark on a journey to Uganda & Rwanda. You’ll visit Bwindi Impenetrable Forest, a national park that’s home to the highest concentration of primates on earth, including the mountain gorilla—now one of the rarest animals on the planet. With nearly 800 of them in the world, more than 450 reside in Uganda, and this park specifically. 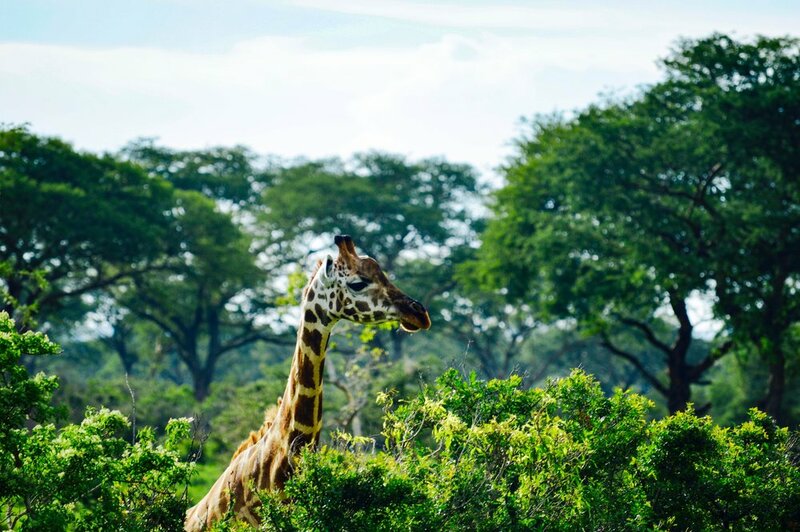 Still one of the world’s best kept natural secrets, Uganda is teeming with pristine lakes, majestic mountains, and some of the most incredible wildlife in all of Africa. Today you’ll arrive at Kigali International Airport, where you’ll meet your professional driver and guide for the day. Take a tour of Kigali and the surrounding countryside, learning about Rwanda’s modern prosperity and challenging past. In the afternoon, you’ll cross the border into Uganda, making your way towards Bwindi Impenetrable Forest. 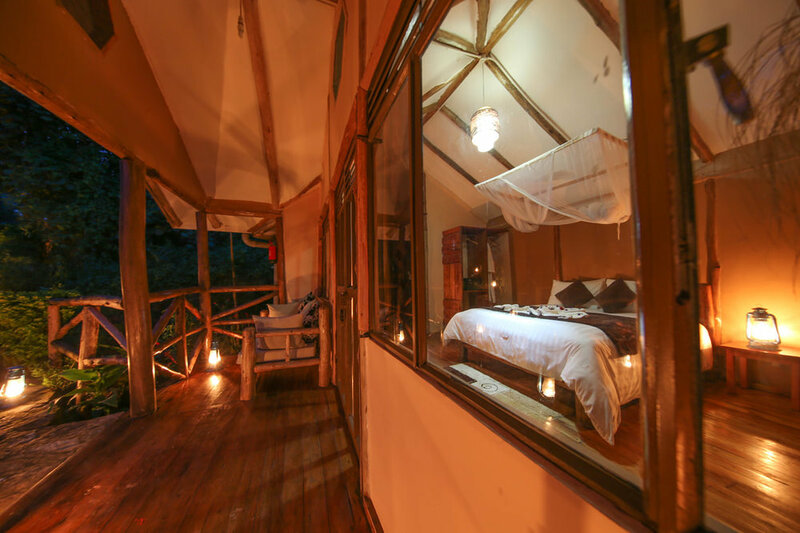 You’ll be spending the next 4 nights at the park’s incredible Sanctuary Gorilla Forest Camp. It’s the perfect base for a trekking experience, as it offers comfort in the heart of the rainforest. 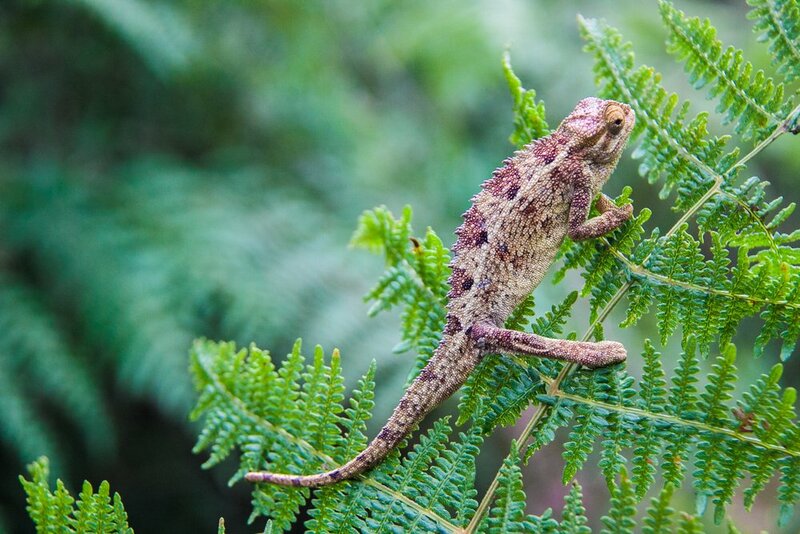 Your evening wouldn’t be complete without a forest walk, bird watching, or a wildlife encounter. 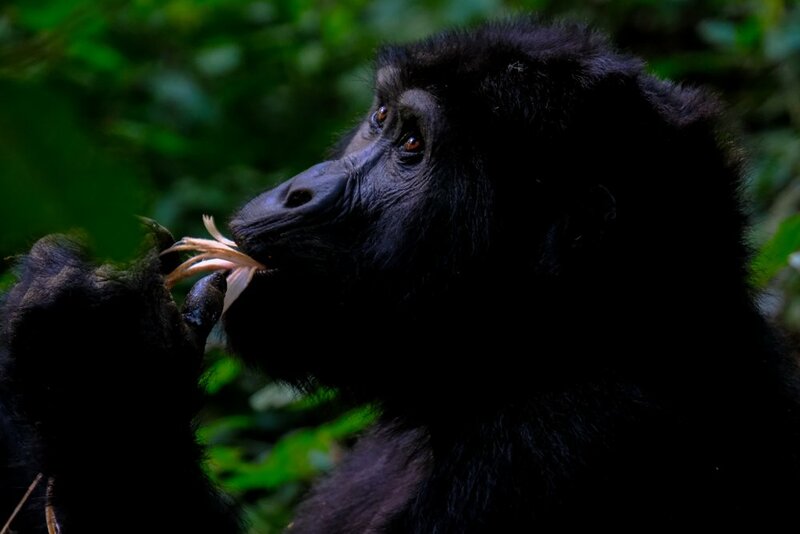 Bwindi is home to numerous rare bird species, the rare forest elephant, giant forest hog, and 11 kinds of primates, such as the red-tailed monkey, black-and-white colobus, baboon, and chimpanzee. In the evening, enjoy a traditional welcome dinner, as you get a first look of what’s to come. Fuel up with an early breakfast followed by a briefing on gorilla trekking. During the talk, experienced park guides, who oversee the safety and well-being of each gorilla family, will go over the necessary precautions to ensure the trek is safe for both you and the gorillas. For several years, every family has undergone an extremely delicate process to gradually adjust to the presence of humans. Trekking commences at park headquarters every morning at 8:30 a.m., with the guides leading the way. The search can take anywhere from 1-3 hours, and once the gorillas are located, your group will spend an hour observing and interacting with them. Enjoy a picnic lunch in the forest then return to camp for an afternoon of leisure, followed by another delightful dinner. Today you’ll embark on another primate trekking experience, this time with chimpanzee families. Once again, you’ll head out from park headquarters in the morning after your professional guide briefs you on necessary protocols. Many guides have been involved in the preservation and protection process of the chimpanzees and various primates in the region. Once the chimpanzees are located, it’ll be the same method as yesterday; you’ll spend one hour hanging out with them. Return to camp for dinner with your local hosts and an enjoy an evening filled with traditional music and dancing. Rise and shine! Wake up early to travel to a local village, where you’ll meet its inhabitants and learn about their day-to-day lives. Visit a honey production site, traditional medicine man, blacksmith, local school, and even attend a Batwa dance performance. This experience is organized with the local community as part of our community support efforts in Uganda. After lunch, embark on an afternoon bird walk with a local expert through the Bwindi Forest, home to over 300 bird species—including 24 that are endemic to the highlands straddling Uganda, Rwanda, and the Congo. You’ll also get to see several of the 200+ species of butterflies found in the park. Afterwards, return to camp for another satisfying dinner. Finish of the evening relaxing with a drink, as you listen to traditional music played on the local Bakiga guitar. It’s time to say goodbye to Uganda. Although it’s always sad to leave such a magical place, reflect on all of the amazing moments you shared and lifelong memories you’ve created. Head to Kigali International Airport for your flight back home.